Join us this Thursday August 30th for Episode #2 – We are scheduled to talk to the Owner of Continental Pageantry System – Jim Flint, the current King of Mr. Gay USA Joey Rivera and our body and face topic for this week is the importance of make-up in pageantry. Don’t forget you can call in LIVE during the show – show starts at 5 pm EST and the call in number is: 718-664-6571. If you can’t listen live, you can subscribe to our podcast network via iTunes and download the shows for free or you can listen to the show on our website (www.clickclickexpose.com) with our podcast player. 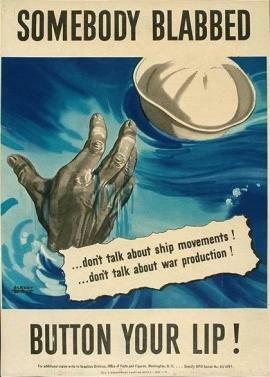 I love this poster – You ever heard the expression Loose lips, Sink Ships…well maybe that should be the motto given to those who have speculated, rumored and offered all kinds of explanations on why the opening of the EOY video was modified. Am I here to set the record straight – NO. Why you say? …our company is bounded by a professional code of conduct. As members of two professional videographer associations, our conduct and business practices are govern by some very specific industry standards – these standards insure that our product, our dealings with clients and the decisions we make are of the highest ethical standards. Needless to say we were approached with a legitimate business concern and with consultation from the owners of EOY we govern ourselves accordingly. There is no pressure, no strong arm tactics – no bowing down to the man. Believe you me, we can hold our own in court – but there is a bigger picture here to consider – a professional code that should be respected, honored and listen too – even if we may be in our legal rights. And thus changes were made. PERIOD – THAT’S IT. I wonder if more people were to follow ethical code of conducts, maybe we wouldn’t have many of the problems that seem to plague this wonderful world we call gay pageantry. My hats off to you all who stay above the fray and keep it professional and ethical. my soap box is done (LOL). NOW FOR SOME GOOD NEWS. Don’t have $60 to spend on the EOY DVD, check out the pageant pay per view. You can rent for 7 days portions of the EOY video for as little as $2.99 up to $5.00. It’s a great way to see the video without spending a lot of money. MORE GOOD NEWS…Have you been to Planet “Q” TV lately?? Well I am on a video uploading spree for the last couple of days. Look for at least 21 new videos added. Everthing from a funny paraody on boy bands, 3 episodes from the Dudershow to some cute eye candy from the Athens Olympics Diving competition. Ever wanted to see what the Ancient Greeks did at their games – well I got some hot video for you to see as well…. More and more gay videos than you can shake a dirty hankerchief at ….or something like that. Check it out – OUR OWN GAY AND LESBIAN VIDEO SHARING SITE – PLANET “Q” TV. I hope you enjoy the videos. Got some suggestions, comments or things you want to share with us….email us at anytime or give us a call. We would love to hear from you. Until then…. Hey everyone…It’s been a little less than a week since I have been on the blog but we are back. We have successfully moved the office and we are back online with all of our equipment and processes (Hooray!!!) – Man I hate moving – it is a pain in the but to tear the office down and then to rebuild it but we had to do it. All of our orders for EOY 2007 have been fulfilled except for 1 person who was delayed. Our error rate (bad encodes or damaged goods for our initial orders) was 1.4%. We are pleased with that rate and the quality we have been able to deliver over the initial EOY orders. There has been a huge interest in this year’s DVD and reports are that people have enjoyed the DVD – awesome!!! NEW NEWS – We have a new podcast show starting this THURSDAY called Pageant Soup with Steve and Marlowe. It will be all the 411 on gay pageantry – dirt, news, gossip and a little fact thrown in for fun. Check it out!! It will be apart of our podcast network of shows which you can subscribe via iTunes from our home page. Well that’s it for now…don’t forget to check out our DJs tonight on CCE Radio – DJ Louie B kicks it off at 6pm, followed by DJ Joelapuss at 8pm, DJ Carlos Dali at 9pm and DJ L Calderin at 11pm – CLICK TO LISTEN TO CCE RADIO HERE to check out the great music. oyyy…13 days, sleepless nights and mountains of papers, tapes, envelopes and empty ink cartridges – the 2007 EOY DVD has been finished. I have 3 boxes next to me filled with everyone’s order ready to be mailed. Next Day air and international orders will get priority first, followed by orders made between July 1 – July 26. Followed by orders made July 27 through Aug 10th. If you placed your order after Aug. 10th, your DVD will not ship until Thursday or Friday August 16th or 17th. Below is a general email message sent to all folks who ordered via our website – I am including it here in case you are one of the folks who ordered and did not get the regular email updates. This email will be a little long. I would like to encourage everyone to read all the way through it and then email me if you have any questions or concerns. 1) Despite a 1 1/2 day delay in production due to some editorial concerns that had to be addressed, I am happy to report that the DVDs are finished and will ship tomorrow August 13, 2007 as promised. If you received an email alert from the United States Postal Service saying that your DVD was or is going to be shipped Tuesday or Wednesday, you can disregard that date. We were originally going to stagger our deliveries based on when you placed your order. I am happy to report that we will be able to mail all orders at the same time. 2) Your DVD was made on high speed DVD media. It is 98% compatible on DVD players made after mid 2005 (There is presently no 100% compatibility on DVD duplication media). If you have an older model DVD player, you will experience play back issues due to the changing nature of DVD media in the past 2 years. Unless you recently bought a $15 Walmart DVD player, you should be okay for DVDs made after mid 2005. . Please remember that dust, dirt, finger prints and smudges can affect playback. Use a lint free cloth or other smooth type surface to clean the DVD disk before playing. 3) If you have an issue with your DVD or other customer service concern, please email us at: ccevideo@empirevideoproductions.com so that we can address any issues you have. You can also call our office at: 305-695-0095 during normal business hours 9 am to 6 pm. Please note that we will be out of the office Monday thru Wednesday so email will be your best option for those days. 4) You will receive 6 DVDs (2 for Friday Night, 2 for Saturday Night and 2 for Finals Night). To maintain the highest quality standard, we chose not to compress all of the nights events onto one DVD per night. Thank you for your patience as we worked as fast and as hard as we can to produce another quality EOY video for you. We hope you enjoy the show. Well folks…just when you think you are finished and ready to move on to the next stage – someone throws a wrinkle in your plans. I had just finished making the DVD master for Friday Night and I was working the DVD master for Saturday Night when an editorial concern was brought up which had to be fixed. Because of that change – it required me to re-master the Friday Night DVD (Disk 1) which I am doing now at 11:40pm at night. I will let the workstation run through the night on this project. Then I have to re-do Disk 2 (that won’t take as long as it does not require me to change any major files within the DVD). Then I will encode and set up Saturday Night. After I have made those 4 disks and Adrian has had a chance to QA all 4 disk – then I will begin the duplication process and labeling all those DVDs…allllll thoooossseee DVDs – there are so many. Once I complete that, then I am waiting on word from the owners on a editorial decision on the Sunday night disk and then I will start producing them (probably on Saturday). So we are nearing the home stretch – one of the toughest part (the creation of the DVD) is finished. Now its duplicating, labeling, art work and getting the orders ready to be mailed. We’re almost there…. Well I am close to wrapping up this EOY project. It has been a long haul. Yesterday was a difficult day – Adrian and Tara had many start and stops in their over 10 hours of tapes for Friday night which made audio/video sync a nightmare. I think I spent over 2 hours just sync video together even before I started editing. That night was running long and I had just over 5 hours of multi-camera footage to go through. It was reduced down to 3 hours and 10 minutes. But alas….Friday is done with everything – I am now making the files I will use to make the DVD. Saturday is done with everything – I will be making the files I will use to make the DVD. Sunday I still have do a creative opening and the top 10 – I will probably do that last after I make the Friday and Saturday DVDs. Also Adrian needs to QA all 3 nights to make sure everything is okay. So that is where things stand right now. So I am getting there – next is the DVD creation process. Here is my home away from home – one of the editing suites. 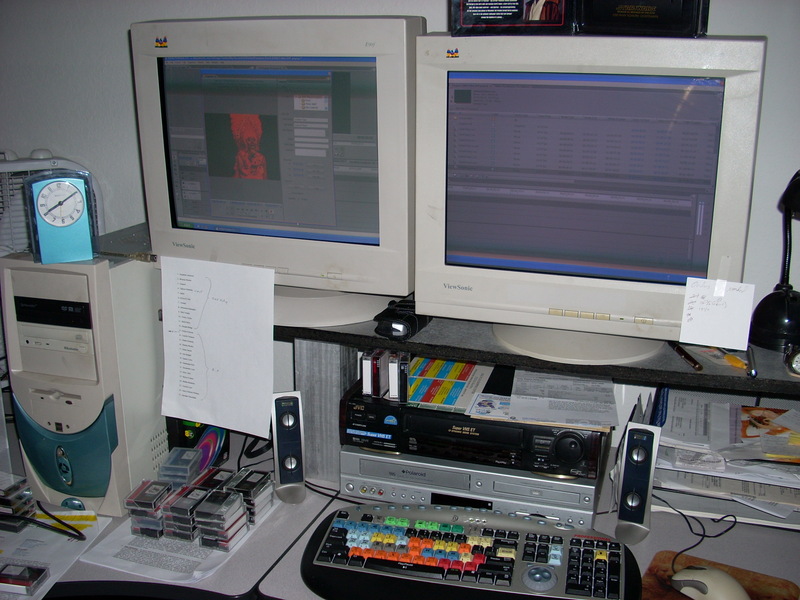 Dual monitor set-up with NTSC video monitor to make sure video looks right on TV. Over a terabyte of external and internal drives and raid drives (you can’t see them very well) with the ability to bring any digital, analog, dvd, vhs – you name it – any content we want can be brought into the workstation to edit. 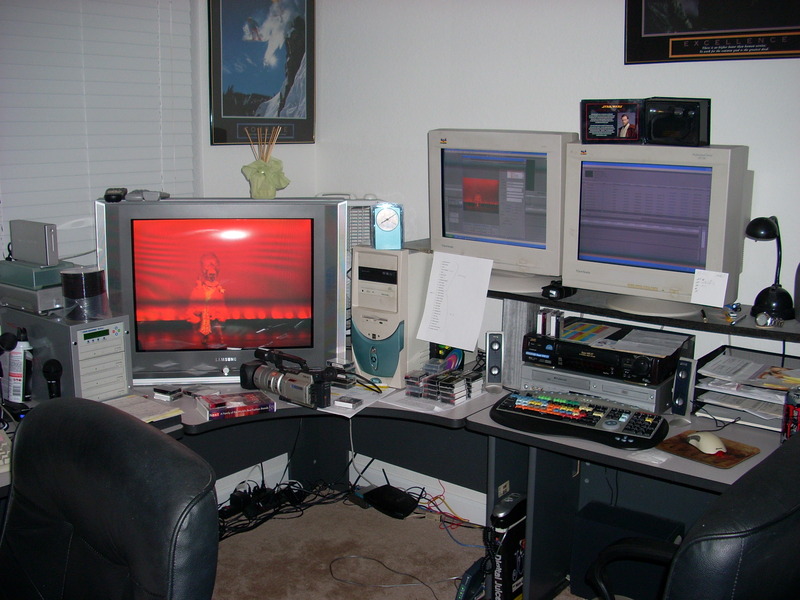 The podcast and audio workstation is to the left (you can’t see it), admin computer to the right and two more editing workstations. Well I am happy to report that Saturday is done!!!!!!!!!!! I went ahead yesterday and created a short simple 30 second opening, dropped all of the gaps out (oh which by the way a 4 hour rough multi-cam edit was trimmed down to 2 hours and 34 minutes), added all of the graphics and voila – a finished product. Some would say..why so long – well the editing process is a very creative process – good editors will use their experience & time to try to create a flow and pace that is pleasing to the eye and ear. For instance in the finals night tape – you can cut between two shots, dissolve between two shots or use 1 of over 1000 different transitions we have to move from shot to another shot. But fancy graphics just for fancy graphics sake doesn’t always make for good video. So in the creative evening wear for example – you have a very slow, pensive musical selection that bodes well with say 2 second dissolves and dip to black transitions between contestants …… or lets say in the case of Mokha’s talent – start off with a slow jazz number – so we use long dissolves between shots – and when the music picks up – we switch to quick cut between camera shots – its these kinds of decisions that can make a good section even better. I can recall one of our clients was mad at us years ago because we did not put fancy effects in their video – especially in the talent category. Artistically we were against it – but you have to do what the client wants (even if we think the client is wrong) and we went through and threw in everything but the kitchen sink. I won’t tell you which video it is but when I look back on it – the question I always asked myself is “did those special effects and the flying this and the flying that really improve the video?” I have to say NO. Now it made some mediocre talents look very flashy but in the end – just throwing in effects doesn’t always work. We usually leave the flashy stuff for nice graphics and opening montages. I remember the very first pageant/drag video we ever did (It was Atlantis Capri’s birthday party in Houston at Club Incognito). We threw in every special effect we had (or almost had). People loved it because they had never seen anything like that for drag video but now our videos are more polished (hehe – in our opinion). Now I am ingesting all of Friday night videos. There were some technical issues with tape movement that night so I am going be at this one for a long time simply because the audio video sync is going to be a nightmare with all of the camera starts and stops. I am not looking forward to this edit. Once I am done with that – then I will go back and edit the beginning of Sunday night and do the top 10. Somebody shoot me!! oyyyyy – well the goal of getting through all 4 hours of saturday’s multi-cam footage didn’t happen – by midnight – I had had enough – so after 30 minutes – I left the rest for today….so from 10am to 2pm – I went through the remaining saturday footage switching camera shots…..long, tedious and fighting the 1000 yard stare —- staring at a computer screen for 4 hours will drive you nuts especially when there is a ton of stuff that won’t be used in the final product. So I wrapped it up by 2:10pm or so and I went through one of the fastest drop edits I have ever done. Since I was pretty annoyed right now….I flew through the timeline in 20 minutes dropping all of the crap out (normally I make my workable file then edit but I wanted the initial edit done NOW) – so I was dropping crap like a hot potato….contestants not ready yet – DROP, hurricane telling an ad because someone did not have their prop on stage, DROP – crowd won’t shut up during Q & A, DROP DROP DROP – flying through the time line cutting out all manner of nonsense. My next update will tell you what I cut the timeline down too…how much you want to bet I shaved off a hour or more useless banter off??? I am exporting my workable file now (that’s the file I will use to create my graphics, titles, opening montage, etc – not to mention closing all of the gaps where I dropped stuff) – once my workable file is done – I will create another sequence and start putting the final touches and graphics done – probably another good 2 to 3 hours of work maybe more depending on how creative I intent to make it. For now while my file is exporting – I need an energy drink or two or three…..
Well I am happy to say that 95% of Finals Night video is done. Today is where the hard work is done. I take a 3 hour and 4 minute rough draft and have to do several things: 1) first I go through the entire video minute by minute and take out all of the down time, mistakes and anything that will take away from the general pace of the video – so the video was trimmed down from 3 hours and 4 minutes to 2 hours and 30 minutes; 2) second I have to create the motion graphic lower thirds – that’s the names you see at the bottom of the screen – we use motion graphics for those which have to be created, adjusted and added to the timeline – boy that takes time; 3) third I have to create the motion graphic cards that introduce each segment and each former entertainer – nothing really fancy here – nice motion graphic that matches the color theme of the evening in letterbox format; 4) then I have to create the names for each and every contest and every former that performed; 5) fifth – I correct for audio anomalies if I can (they had some small audio issues that night) which of course we pick up rather well because we are patched into their system and finally; 6) I render all of my files, graphics, audio etc so that I can preview the entire timeline in realtime. So 95% done – the only thing I have left to do (which Adrian will assist) is create a creative opening to the video and I want to re-do how we will showcase the top 10 since the filming of it was uninspired. I think Adrian has some ideas of what he wants to do here – so we will sit down to discuss that. I started at 9am and finished around 3pm. So I think I am taking a break for a couple of hours. When I return – I will throw up the 8 hours of video for saturday night and put together the rough draft video of that night- so about 30 minutes or so to sync up mulitple audio/video tracks and then I have to go through all 4 hours of video and pick out the best camera shots for the night. So that will be the last thing I work on tonight so about 5 more hours of work…the life of an editor…. So if I were to tally up the time spent so far in editing and working on this project for the last 4 days – I would say I am at 26 hours of editing (just me) – Adrian and Tara logged in 34 hours of filming (together) and 3 hours of editing, uploading and encoding the preview clips. hmmmmm……. Hooray….I am finish with the multi-cam rough edit of Sunday…only Friday and Saturday left. What is a multi-cam rough edit – basically I sync up both cameras for the entire Sunday pageant. Then I watch the pageant from beginning to end switching between each camera – the best shots at the moment that highlight the performance or whoever is talking. It is almost like live switching of cameras instead I am doing it with two cameras that were running at the same time at the pageant. Now that the rough edit is done. I will have to go back through that 3 hours and 4 minutes of pageant night – take out any downtime and take out anything that we feel does not fit the flow of the video. While the goal is to include as much as possible – sometimes it is not necessary to include all of the host comedic banter or other small wait periods – because it simply does not add any value or pace to the video. So tomorrow I will go through the video taking out the appropriate edits..then I will add the lower third graphics, cg art work for the former title holders and I may work on an opening montage tomorrow – sometimes I wait to do the opening montage last because we can take hours trying to create a nice looking 1 minute opening. But at least at this point – I have one rough edit finished…only 2 to go. Well it has been another long day. I have all of Sunday night uploaded to the workstation. This was the first time I actually got to see some of the show – WOW….Armani…WOW….DeeRanged…WOW….Kitty – I really liked some of the stuff I saw. So the first order of the day was to get all of the footage up. It only took a little over 6 hours today since Finals Night is not as long as Prelim. So the next step today was to get the last preview clip up that I know everyone has been dying to see. As we speak (or as I write) I am uploading the clip to Planet “Q” TV and to Daily Motion. I will get it to You Tube (along with the other clips I have on Planet “Q”) tomorrow morning. I think you will like the clip. Making it was a headache. So I started editing the clip – dropping in the music – timing some of the clips to the beats in the music – when all of a sudden – my workstation crashes and I am stuck in a perpetual reboot cycle. So I am cursing up a storm and getting pissed – so I decided to dump the computer into safe mode, shut down and restart. Seems to work – open up my editing program – locks up big time…so after 20 minutes of trouble shooting – I figured out the problem. Apparently Premiere doesn’t like you using your hard drive up to the last mb. I was like down to 50 mb on one of my A/V drives. Oops – so I moved some files around (mind you I have captured more than 190GB of video files and I haven’t even done Friday yet) and voila – back in a business – continue working on the preview clip, exported, encoded in a variety of formats and uploaded. Daily Motion just finished and now I just wait for the site to post my video…My upload to Planet “Q” was finished but I am re-encoding the video. I wanted to throw up a much higher encode rate but the player is causing jerky video (looks beautiful but jerky) so I will settle for their standard rate. The video will still look good. Well that’s it for now. I haven’t decided tomorrow if I want to capture Friday or start putting together Sunday…hmmm… I will sleep on it. See you all tomorrow…enjoy the preview video.